Fr. Chrysostomos with students and Fr. Chad Hatfield after his lecture (photo: Herman Fields)Many visitors frequent our campus each Academic Year: bishops, priests, musicians, academics, monastics, potential students, and so forth. All of them enrich our lives as seminarians as we converse with them, share meals with them, and worship together. On February 4, 2017, Archimandrite Chrysostomos Onyekakeyah from Nigeria came to St. Vladimir's to talk to us students about Orthodox mission work in Africa. With the permission of the Seminary’s President, Fr. Chad Hatfield, I had issued the invitation to Fr. Chrysostom, whom I’d met during my parish assignment at St. Nicholas Antiochian Cathedral in Brooklyn. I had already learned a bit about his fascinating life, and I wanted him to share his story further with me and with my fellow seminarians. We found out that Fr. Chrysostomos serves large communities of converts, by riding from village to village each Sunday on his bicycle, and organizing benevolent projects for the elderly and for orphans. 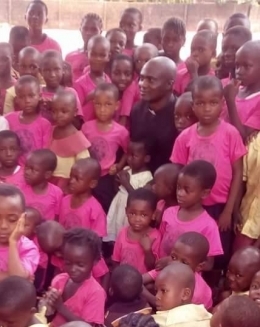 We also discovered that he runs St. Christopher's, an orphanage and elementary school in rural Nigeria, under the jurisdiction of the Greek Orthodox Patriarchate of Alexandria. Very interesting to me was Fr. Chrysostomos’ statement that the Orthodox Church in this particular mission field makes a number of concessions to local custom, a phenomenon he calls “enculturation.” By blessing and accommodating not only the local language, but also some local customs, the Church succeeds in making Orthodox Christianity truly organic and local, while unequivocally remaining inside of the universal canonical church tradition. Even more interesting to us all were Fr. Chrysostomos’ descriptions of the church services: his sermons are often more than an hour long, and are given in a manner that invites congregational response and interaction; baptisms involve performing the sacrament with twenty or thirty children during the same service—such is the growth rate of the Orthodox communities he serves; and so many children are being communed on a Sunday that distributing Holy Communion can take from 45 minutes to an hour! I, and my fellow seminarians, learn a lot when we follow our Lord’s admonition to welcome strangers (Matt 25.35). I’m told by Fr. Chad that Fr. Chrysostom’s visit has providentially led to the possibility of his coming in the near future to St. Vladimir’s for study, along with other Nigerian students. I’m so blessed to have had that initial conversation with Fr. Chrysostom at my parish assignment—it’s opened doors and pathways, both spiritually and materially, for both of us.